Have you tried Nasi Ulam yet? Nasi is a Malay word for cooked rice. Ulam is generally greens plants or herbs that we eat them raw with rice and sambal belacan. 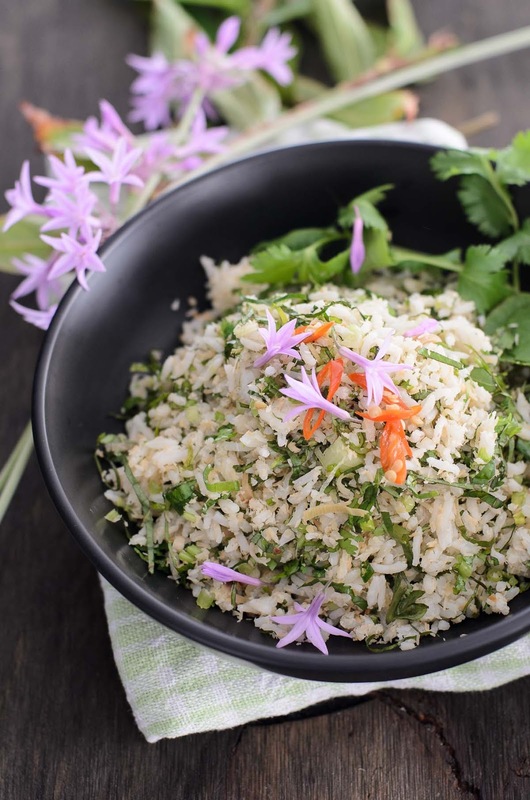 Mix the rice and the herbs, and you will have this bowl of addictive Asian Herbs Rice Salad or better known as Nasi Ulam. 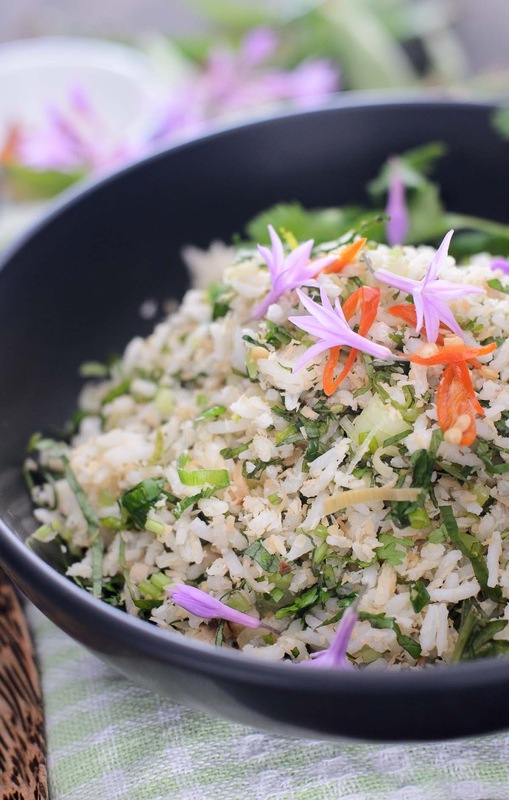 If you happened to be travelling in Malaysia, you will definitely come across Asian Herbs Rice Salad / Nasi Ulam. And there are many versions of Asian Herbs Rice Salad / Nasi Ulam. Some part of Malaysia (east coast) have their Asian Herbs Rice Salad / Nasi Ulam in beautiful shade of blue (rice cooked in blue pea flowers tea). Some serve Asian Herbs Rice Salad / Nasi Ulam with salted dried fish. Others may have with thick fish curry. Some would add pounded dried shrimps and prawn granules (belacan) for that extra fishy, salty taste. 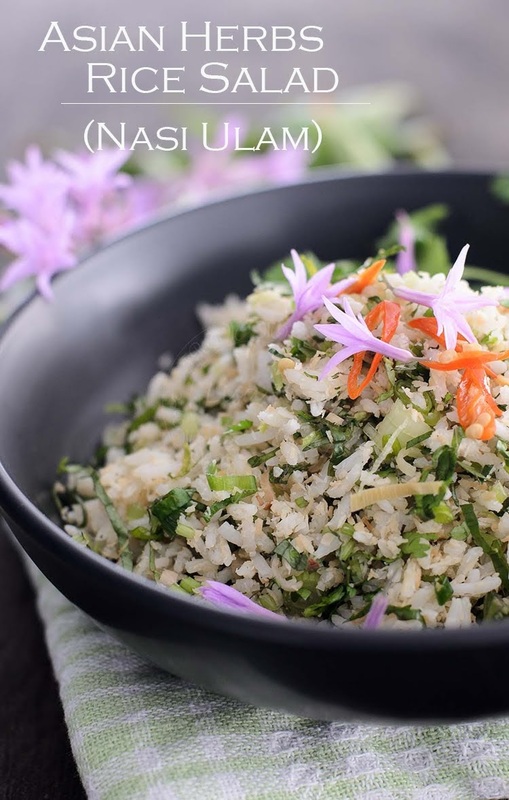 The best part of this Asian Herbs Rice Salad / Nasi Ulam, apart from being addictive, there is no set rules of what type of herbs you must add to the bowl. You can add anything that you like... in moderation of course! its best that you have a taste of each herbs before adding. Pennywort leaves (daun pegaga) are bitey and have a slight bitter aftertaste. Vietnamese mint has strong taste too. Betel leaves (daun kadok), too much will be overpowering to the rest of the herbs. I blogged about this Asian Herbs Rice Salad / Nasi Ulam before, in 2010. Basil, parsley, mint and sweet Thai basil, plus others like Vietnamese mint and my staple coriander leaves, were added to my Asian Herbs Rice Salad / Nasi Ulam then. Since I have pennywort and betel leaves plants growing in my backyard, these two makes an excellent choice to be added to my 2018 Asian Herbs Rice Salad / Nasi Ulam blogpost! This time round, I make it 100% vegetarian! Oh yeah... just in case you are wondering.... those tiny gorgeous purple/ violet flowers are society garlic flowers. Rice Salad using Asian herbs and greens either grown in the garden or bought. Its known as Nasi Ulam in Malaysia. Its very addictive. Washed and thinly sliced all the fresh and raw ingredients above. 1) the weight for each herbs are as guideline. You can either increase or decrease according to your tastebuds. Take note that some leaves are bitter and bitey.